The RAF has acquired a satellite that can beam live video footage from space, the head of the air force told an industry gathering in Surrey today. 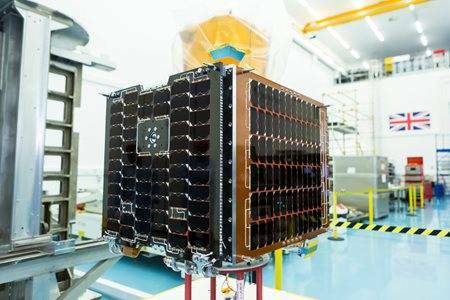 The Carbonite-2 satellite, built by Airbus Defence and Space subsidiary Surrey Satellites, based near Guildford, will be used by British military intelligence folk as a concept demonstrator. The satellite was "launched into a 505km sun-synchronous orbit on board the PSLV launch vehicle from the Satash Dhawan Space Centre in Sriharikota, India on 12 January 2018 at UTC/GMT 03:59," Surrey Satellites said in a statement. "It's entirely fitting that we have launched this highly capable satellite in the centenary year of the Royal Air Force. We have always been at the leading edge of technology, constantly innovating and expanding our horizons," beamed Air Chief Marshal Sir Stephen Dalton, the professional head of the RAF. The 100kg spacecraft, which the Ministry of Defence spent £4.5m on just eight months ago, mounts a commercial-off-the-shelf telescope and HD video fit, both of which "have been adapted for a space environment and integrated into a custom built framework," according to the company. Its imaging system is "designed to deliver 1m resolution images and colour HD video clips with a swath width of 5km," and, according to a BBC interview with the firm, can collect 50fps imagery in two-minute bursts. Chief exec Richard Blain told the Beeb that he reckoned the bird's "effective resolution" could be as low as "65 to 75cm". Imagery from the Carbonite satellite will be crunched by British startup Earth-i, which boasts Sir Joe French as a non-exec director. Sir Joe is a former chief of defence intelligence and a one-time director-general of intelligence acquisition at the MoD, as well as a former non-exec of Surrey Satellites. Another notable bod from Earth-i is CTO John Linwood, a one-time senior engineering veep of Yahoo! and an ex-BBC CTO. Output from Carbonite-2 "will be used by the Joint Forces Command National Centre for Geospatial Intelligence," according to the MoD. An "organic" (in-house, in MoD-speak) ability to surveil particular locations and pick up physical changes at short notice is an obviously valuable thing for the military; anyone who has tried to use Google Earth satellite image data to check the road layout of a particular area will instantly recognise the problem. The first application for this technology that springs to mind is monitoring Russian military movements in Eastern Europe, which might be a scenario that also occurred to defence minister Guto Bebb, judging by his canned quote: "We live in an increasingly dangerous world and satellite technology like this give our Armed Forces the extra advantage of quick video surveillance to keep us safe from a range of future threats, whether that's an airborne terror attack or a troop of tanks closing in on a foreign border." Currently the Armed Forces' satellite needs are met by the not-at-all-scarily-named Skynet 5 constellation, due for replacement in 2025 by the planned Skynet 6a constellation. Everything from communications to command-and-control data flows through the Skynet birds.